"And they need no candle, neither light of the sun"
Every picture-lover knows that some pictures are better when seen from a distance, while others need to be examined at close quarters to bring out their best effects. The former are roughly drawn, with their commanding features standing out as soon as detail ceases to assert itself. The latter consist almost entirely of detail, delicately joined together, but with no assertive cohesion about them, like flesh without a skeleton. Take Trinity as an example. It has its difficult climbs, but it has taken many years to find them, and they appear rather as emphasized detail than as natural prominences. The Great Gate and the Library Chimney might try to pose as major ascents, but they are only moderately difficult. The Gateway Column, though a difficult and delightful climb, is one which most people would overlook unless forewarned of it. The Fourth Court climb, jostling with the Gateway Column and the Fountain for the honour of the hardest climb in Trinity, has nothing very unique to distinguish it from many other climbs slightly less difficult. Trinity, from afar, looks blurred. King's and Clare are just the opposite. There is little pretty climbing in them, no interesting rambling for the roof-hiker, except perhaps the roofs round Webb's Court in King's. Pretty detail is lacking, and five or six severe climbs stand out, stark and challenging. These are the Chapel, Porter's Lodge and Chetwynd Chimney in King's, and the Corner and Ladder climbs in Clare. Before doing these, we will look round to see what we can find in the way of other climbs. Going round the first court of King's, we find a buttress on the King's Parade side of Hall, seeming to make an easy chimney with the main wall. Several climbers have come to us independently and told us of this chimney, announcing their discovery with the zeal of pioneers. But it is too narrow. A Tom Thumb might struggle up, and steal a march on those of more normal proportions, but the average man could not do so. Proceeding towards the river, we come to Gibb's building on our right. An isolated and rectangular block rising to a height of fifty feet, it appears to offer no possibility of a climb. Close scrutiny, however, will reveal a possible way of reaching the roof. So far as we know it has never been exploited, and as we ourselves have not attempted it we will omit it altogether. This will give climbers the pleasure of looking for it; it is very severe. A half-minute climb can be made up to the top of the pillars of the central archway of this building. With the back against a pillar, the feet walk up the slots opposite. At the top, we are told, one may slip through to the side of the pillar away from the arch, on to a ledge at the side and so on to the massive sloping terrace above. A certain Canadian up at King's was once obsessed with an idea about Gibb's. This was to introduce some goats on to the roof. Climbing was not necessary, but the creatures would have to be carried through the room of a sleeping don and through a trap-door to the roof. The vision of a troupe of porters coaxing bearded animals to come off a roof-top appealed to his imagination. As we have said, it was not a mere fantasy, but an obsession. With an English friend he drove round the countryside, casting longing eyes at the goats tethered by the verge. He made enquiries as to whether it would be cruel to chloroform a goat; he planned a scheme of smuggling the animals into college in a punt, and had fertile ideas about Doping the Don, or enticing him from his rooms for the night. Wandering down as far as the river, we find nothing to climb except some bleak pipes on Bodley's building. 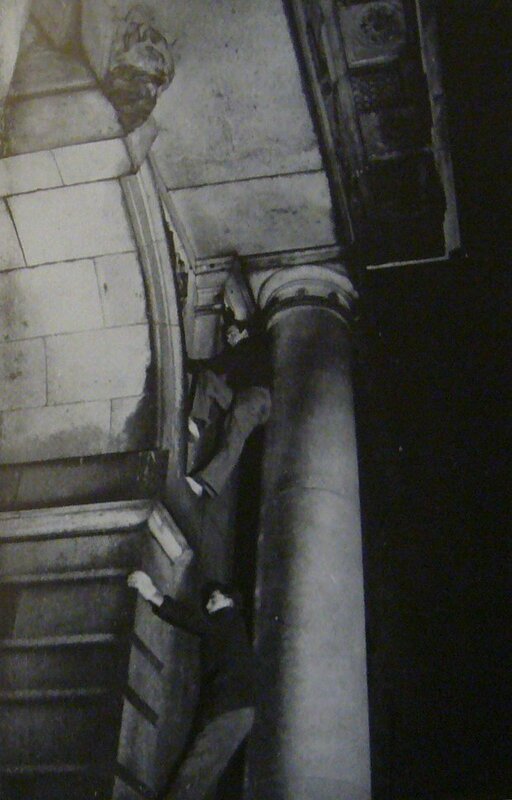 These have occasionally been climbed, and a friend of ours was once suspended half-way up one of them for twenty-five minutes while the tutor and the junior dean chatted on the grass below; but they offer nothing different from scores of other bleak pipes. So we will return and go up on to the roof of Webb's. An amusing hour can quite well be spent up here. Over the Kitchen is a sort of cupola with a ball in the top which can be climbed by a direct pull-up. There is an intricate maze of roof-levels which can be explored by those who so wish. On the south side are some chimney-stacks on to which one may pull up with a scramble. The only occasion we have visited the roof of this court was over two years ago, when we started from outside the college in King's Lane. The Kitchen office is close to the cupola. If its window is open (as is was on that occasion) one can wander through the Kitchen quarters and the Buttery and learn much of interest about preparing food for the multitude. Leaving by a ground-floor buttery window, we will go to Queen's Road and approach Clare from over the river to tackle the easiest of our five climbs. The back gate is easily surmounted, though a hasty climber may brick his foot on the spikes four feet up, which are deceptively sharp. Just before the bridge there are some tricky spiked iron railings to negotiate. The softly along the gravel path, until we are under the gate of the building. 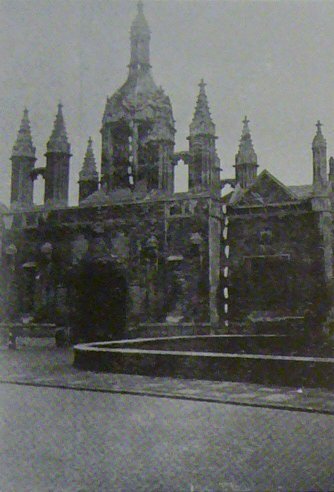 We believe that the Mater's Lodge is on either site of this. The climb before us is the Clare Ladder. The method we adopted was to climb the bars of the iron gate as high as possible. There is then a ledge on the left with ample room for a foot. A small ledge two and a half feet above this affords a good hand-hold, and it is possible to leave the grill. A rather clumby traverse now takes place round the semi-circular pilar, and one gets on to the ladder proper. This consists of narrow slots in the stone, in which a rubber shoe does not feel safe, owing to their small size. One can rest comfortably on the broad ledge above the gate, and then on to the most difficult bit. There is a square drain-pipe round to the left which provides scant assistance, as in only one place can one get fingers behind it. However it helps a little. One more or less has to trust to the ladder of narrow slots. Soon one can grasp a ledge, and from now on it is easier. 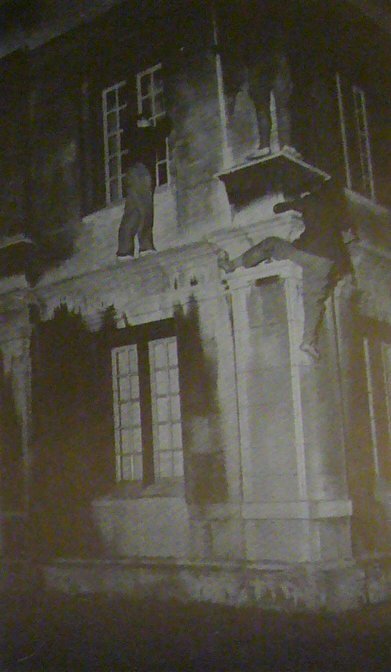 The building drops back a few inches to the left of the ladder, and the ledge projects sideways, so that one can get one's fingers behind (see photograph, just below the climber's right foot). It does not feel too safe, but at one moment it bore a climber's whole weight. This was bad climbing. The last fifteen feet are easier. 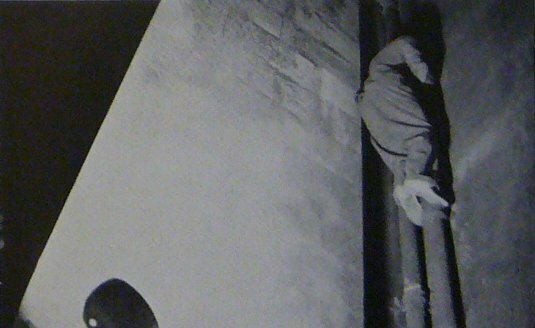 The bowl of the pipe is not far above the climber's hear, and once he has a hand on this he can soon get to the parapet on the left. The descent is nearly as difficult at the ascent. We first read of this climb in a series of articles entitled "Alpine Sports in Cambridge", published anonymously in the Cambridge Review in 1924. We have done several of the climbs described in these articles, but this was the only one of which we should not otherwise have known. The second of our five climbs is the south-east corner of Clare, abutting on to King's. The climb starts twenty yards from the foot of the chapel. It is a deceptive climb. 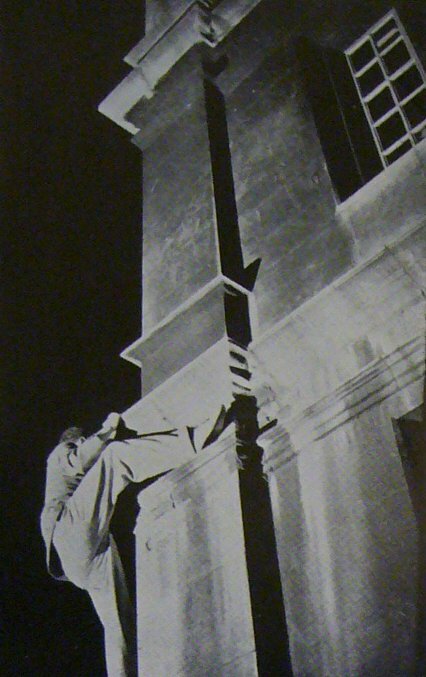 On the exposed corner of a building, and with three pitches of seven feet with no foot-hold and no hand-holds except two vertical ledges, is appears at first sight to be impossible. In reality it is not too bad. A little determination and reasonable tummy muscles are more important in this case thatn technical skill. The clue to the climb are the vertical ledges two feet to each side, where the building drops back a few inches from the corner-stone. These prevent the climber from falling away from the building. The horizontal ledges are in groups of three, a foot separating the lower two and nearly two feet the upper two. The middle one is quite broad, so that one can traverse on it along the whole face of the building. Reaching the bottom ledge from a ledge three feet from the ground, pull up until you can reach the middle ledge, on which you must also pull up. As soon as possible, get both feet on to the bottom ledge. To do this, the vertical ledges may help, holding them above the top horizontal ledge. Standing on the bottom ledge, you can walk up on to the top ledge, sliding the hands up the vertical ledges. You are now on the second seven-foot pitch. It is exactly the same as the first, only about twelve feet higher. The third is the same as the second, and by now you may be feeling tired. After the third pull-up you are on the roof. Coming down is easier, though it is not too pleasant having to keep lowering oneself to arm's length. This climb is interesting in that the arms play a more important part than the legs. Seldom does a climber have to do a straight pull-up, yet here he must do several, since there is not the scratch of a foot-hold to help him on the three seven-foot pitches. The "Alpine Sports in Cambridge" series also contains this climb, though we first heard of it elsewhere. 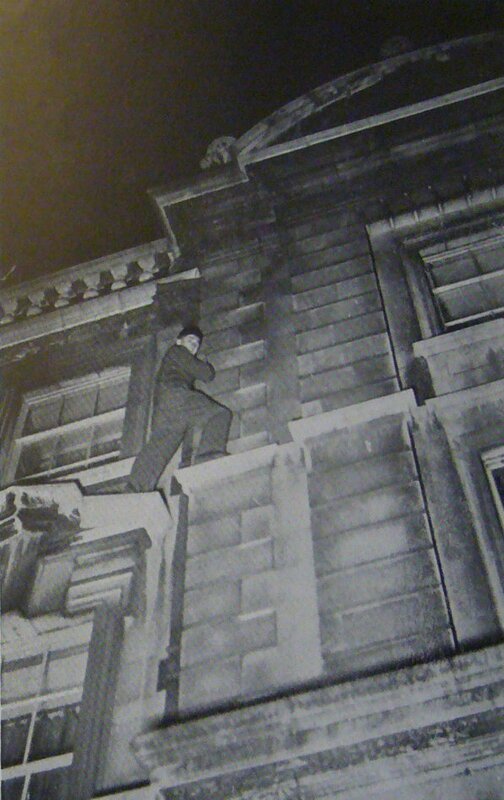 There was a Kingsman who considered this his pet climb; he used to go up to the first or second ledge once or twice a week and traverse along the face of the building. An alternative way up this climb is to be found five yards to the left. This is up the right-hand side of the nearest window but one. The climbing is practically identical, except that the vertical ledges are only eighteen inches apart, and parallel to each other instead of at right angles. This makes it slightly harder. The hold is a flat friction-hold on the flat ledges between the two hands, known in technical parlance, we believe, as a Thank-God hold. 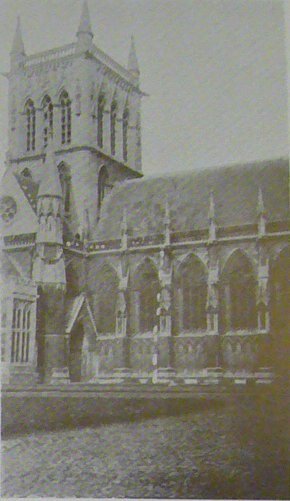 We have now reached the roof of Clare by two routes; for the insatiate climber there is a third, whereby the roof of both Clare and Trinity Hall can be reached. This is the narrow passage half-way between Trinity Hall porter's lodge and the King's north gate. Leading along between two high walls, it is of ideal width for chimneying. Some high and rather forlorn spikes are near the road, but these offer no serious difficulty. The wall on both sides are very smooth, and some climber might prefer to go up in bare feet. We have not been up this chimney, but know it to have been climbed. Leaving this chimney and also Clare, we will go to King's and start the heavy stuff. The chapel we will leave to another chapter, and tackle the porter's lodge. The ascent of this easy-looking building has been attempted by many climbers with monotonous lack of success. Though not so exposed, the climbing is considerably more severe than that on the chapel, and as far as we know the unroped ascent has only once been achieved. From the ground to the roof is easy. A pipe runs down in a corner on the street side, to the right of the gate. The only danger is that it runs close to a porter's window, and he is liable to wake up. On two occasions we have awakened a porter when coming down this pipe. Figure 13-1. Central Archway, Gibbs. The idea is to get round on to the top of the archway. Figure 13-5. Clare, the Ladder Climb. Harder than it looks, as the square pipe does not help, being close to the wall. Figure 13-6. South-east corner of Clare. Note scratches of previous climbers above present climber. Figure 13-7. South-east corner of Clare. On the roof it will be seen that the tower rises from a sloping inner roof of slates. One starts up some clover-leaf air-holes and quickly up until the head is level with the clock face. Each of the hours on this face is marked by a stone wedge, unsatisfactory as a hand-hold but the best one can have. At this point one begins to appreciate the unpleasantness of the climb. The holds are so inadequate that one cannot lean outwards; one must keep as close to the building as a barnacle. For a wedge with the tongue pointing outwards one can pull downwards, but not outwards. Further, one must grip very tightly to counteract the inadequacy of the hold. The result is that one tires very quickly. Unless one can very soon reach the ledge above, one must come down again for a rest. 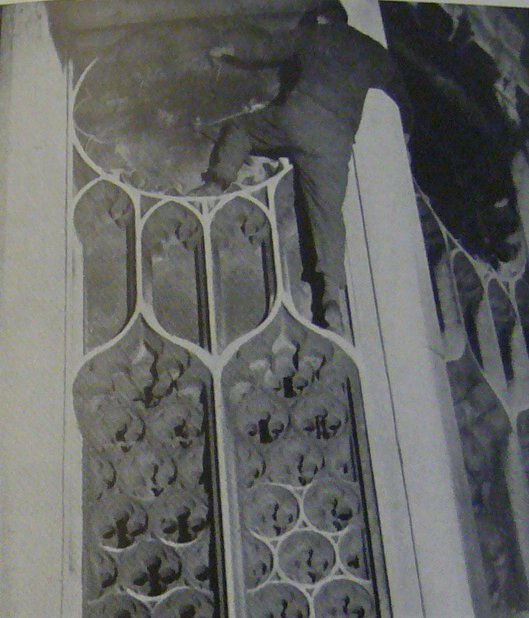 With an arm round the pillar one may try to use a similar method to that which is used on the chapel to surmount the first overhang. There is no incut edge for the fingers on the far side, however, and one must grasp one of the hour knobs on the far side. It is difficult to get higher than the last foothold below the clock --- perhaps a knee on the six o'clock is the easiest way. With a hand at last on the ledge above we can stand by the fleur-de-lis and take a rest. Ribs of stone run up this, and bring the climber up to the base of the needle. We will quote a few words from the man who achieved the climb. "Climbing up the Onion was easy, though the stone is crumbly, and where it straightens up I had to put my arms around it in the affectionate way I had seen in use on the lamented Amelia (see below); then there is another arm-pull to the lower of the two ridges round the turret, yet another to the higher, and here tragically my arms gave out. As the place is extremely exposed, I came down; and much to my surprise was able to get down over the overhang without falling. Modestly, I consider this to be a quite remarkable feat, and as I cannot remember how I did it, must conclude that my fear of falling off was too strong for gravity; certainly I have never before hung on to precarious hand-holds with such a leech-like tenacity." The above climber was graciously repeating his effort for the camera when a misfortune occurred. The Inefficient Photographer  was looking at the flashlight, and pressing various knobs and buttons to see what would happen. The bulbs, tiring of this familiarity, flashed off in his face, blinding him for the rest of the night and part of the next day. They were the last three bulbs, and the climber, heaving a sigh of relief, came down and took the first boat leaving England. In his absence two other climbers tried one night to reach the top, but failed. attributed this to the clumsiness of some builders some months previously. In pursuance of their no-damage policy, the photographers sent an anonymous letter with three pounds, entitled "conscience money". The bursar must have been considerably surprised. On three successive occasions climbers on the Porter's Lodge betrayed themselves while on the roof. On the first occasion two Kingsmen were concerned, and they got away comfortably. On the second, an alien party was involved, and had difficulty in escaping. With a porter on the ground and a porter on the roof, one of them was forced to drop from the ivy-covered screens at the side of the Lodge. He was not hurt, and with the elder of the two porters on the ground, made good his escape. The third occasion was mildly dramatic. Another two Kingsmen were involved, and to be seen was to be recognised. 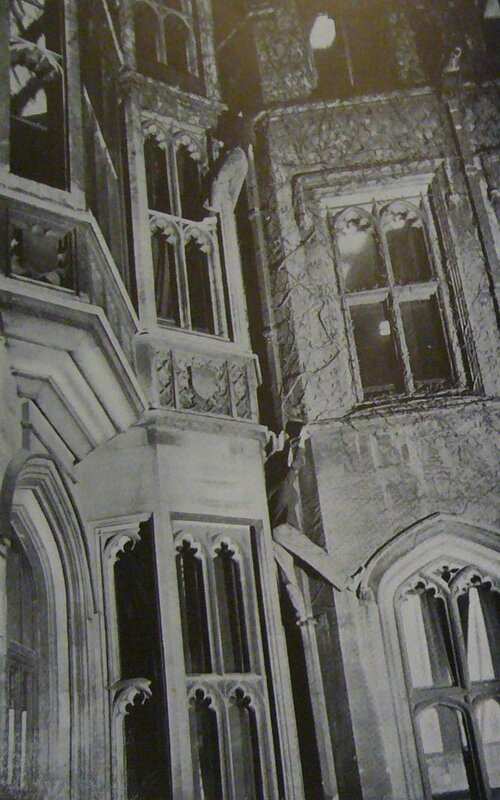 The first climber rattled the pipe, and a night-capped head appeared at the window. There was a bellow of "Police!" which No. 2, still on the roof, did not like. He slipped down the pipe quickly and inelegantly, and bending down so as not to be recognised, pounded away in bare feet. The policeman was at the far end of his beat, and all was well. 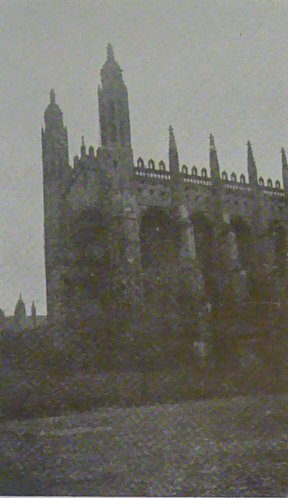 In our undergraduate days, before we realised the difficulty of the Lodge climb, we once wanted to adorn the pinnacle with a bust such as may be seen in a milliner's shop. Walking into a large store at lunch-time one Saturday, we asked for a female torso. The lady behind the counter astutely sent for the manager, who came up obviously expecting to have to deal tactfully with a lunatic. At an almost prohibitive cost a bust was procured, and was solemnly christened Amelia. She was a companionable maiden, and lived through some exciting times; but alas she was never destined to look down on the world from a college pinnacle. Discarded and forgotten, she is languishing in a dusty attic; a butterfly is hibernating on her breast. This looks easy enough, and perhaps it is; but none of the photographers has found it so. To us it seems very severe, and as one climbs it is difficult to forget the stone paving-stones below. Start up the chimney facing the reading-room window. With back-and-knee work, a press-up with the right hand on the middle ledge of the window, and a wriggle, you can stand up on the ledge. Now turn right round in the chimney, using the square drain-pipe to prevent yourself from falling outwards. In the wall whose length you are facing is a window, arched over with a sloping projecting flange. Step on to this with one leg. This enables you to get considerably higher, and you can comfortably reach the iron binding six inches below the overhang. This offers a good end-joint finger-grip, but no more. You can soon get a moderate grip on the first overhang, and half pulling up and half chimneying, you can get over. A crested shield away to the left and higher than the overhang may help. The second overhang is even more formidable. It involves going out a foot or two on to the window ledge on the left. In summer it is cloaked in heavy vegetation. Only one of our party has succeeded in achieving the whole climb; three have tried. Figure 13-8. Porter's Lodge. The clock face. Figure 13-9. King's Porter's Lodge. Ground to roof. Figure 13-10. King's, Chetwynd Crack. This is severe. There are two chockstones, just above each climber, making formidable overhangs. Anyone who desires an evening of roof-hiking without the preliminary climbing can get out from the top window above the second overhang. He can try a little mild climbing up the twin pinnacles of Hall. The stone is not too safe; when we climbed one of them a large piece of stone broke off and clattered noisily down the slates. And now the chapel. To climbers the chapel is a building with a history, and although we have unearthed but a few of its secrets, a little has come to light. We have no crystal to amplify this light, no magic mirror to reflect the vanished happenings of the past. Epics may have escaped our notice, tremendous deeds of valour dismissed in a line for want of further information. But what little we have found we will record. The tale of the college crocuses is sometimes attributed to this man. We cannot vouch for his responsibility, though the tale itself is true enough. Wishing to embellish the grass of its lawns, the college ordered a consignment of crocus bulbs. The offer of some undergraduates to plant them was graciously accepted, and the self-appointed gardeners set to work. The task was completed, and like most of such tasks forgotten. For months nothing happened. Then came the early spring, and little heads began to peep aboce the ground. In letters large and for the world to see there grew out of the ground the exhortation 'Bother the Dean', or works to that effect, passing from green suspicion to golden certainty. Of course, this tale has nothing to do with climbing. A generic, rather than a specific name.